If you want to change visual appearance of Windows 7 login screen, you can easily change this using free tool Windows 7 Login Changer. To get started, click browse button and select multiple images to appear at Windows 7 Login screen. 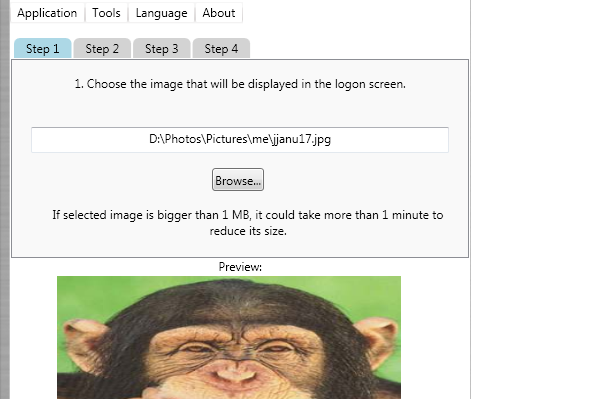 This tool will randomly show image from specified images or you can configure same by clicking “Step 3″ tab on the utility window. It supports most of the popular image formats like JPG, PNG, BMP, GIF. Download Windows 7 Logon Changer (requires .NET 3.5) to see different image during login or revert to default anytime.